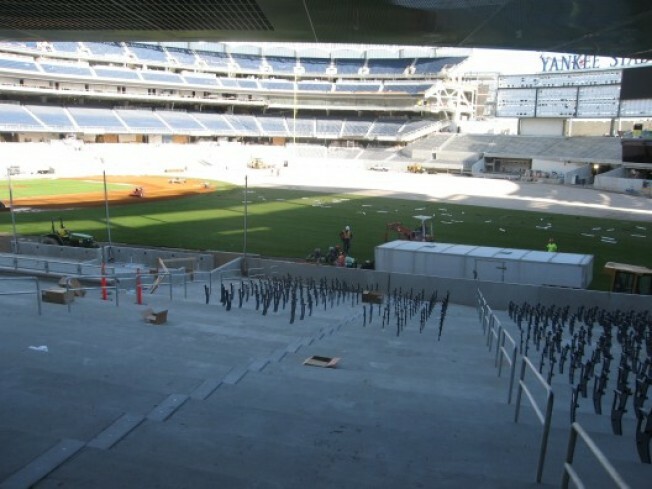 Curbed tipsters turn up in the most surprising places, and this week that list includes the new Yankee Stadium, where a top secret Curbed source (note: not Hank Steinbrenner) witnessed the new field being installed. In just six months, the likes of Melky Cabrera (perhaps?) and Bobby Abreu (maybe?) will be running down fly balls on that outfield, but for now there's work left to be done. Writes our tipster, "Most of the seats are installed. A couple more good weeks of weather and they'll be almost there." So maybe not playing October baseball was actually a good thing in the end. Yeah, we'll keep telling ourselves that.